I have assembled a pretty extensive table containing all that I have collected so far that may relate to both Tullyvallen as well as to various relations of JACKSONs. I suspect they will turn out to be related to the families of Liscalgot & Urker. Update: January 1, 2019. Added map of all Tullyvallen townlands. Updated January 13, 2019 New images and details - in highlighted cells. Tullyvallen Jacksons and various relations of theirs. The map beneath is based on the map which can be found at Irish Townlands. 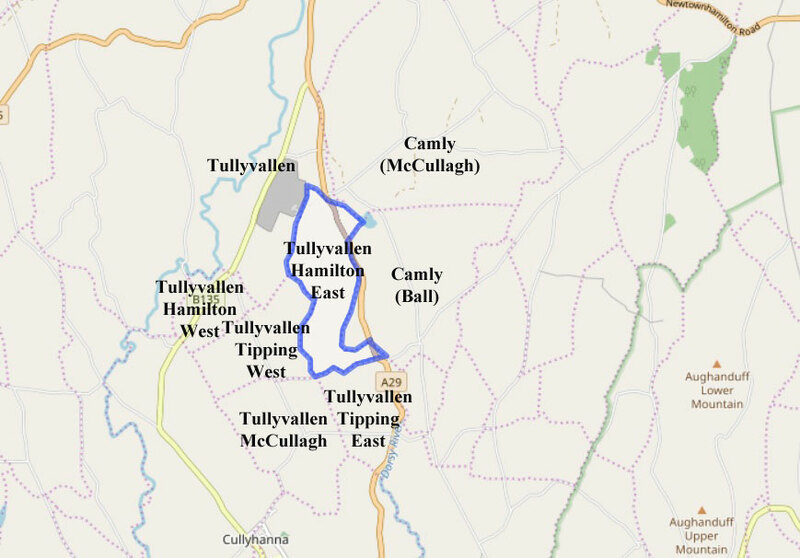 There are 6 townlands with the name Tullyvallen. NOTE the uppermost tip of Tullyvallen Hamilton West. It is bounded by the Cullyhanna River. Further north, the Cullyhanna River was known as the White River, and further south it was known as the Creggan River. Eventually the White, Cullyhanna and Creggan Rivers (all the same river) flow into the Castletown River in Co. Louth which enters the sea at Dundalk. Bearing in mind that rivers often made for better transportation routes than roads, this is a significant river to track. The map beneath includes a property looks to be a perfect fit with that section in the uppermost tip of Tullyvallen Hamilton West. This section of 5 acres includes the ruins of a mill. SOURCE: This image has been made available for use on this site thanks to the Armagh County Museum (accession # ARMCM.1.2019). Newtownhamilton is on the northern border of the Parish of Creggan. Thi is near where the JACKSONs of Urker and Lisnadill lived. I have also included the BROWNEs of Tullyvallen in the following table. They are potentially interesting in terms of my notion that Rev. Daniel Gunn BROWNE – who lived and held a lease at Glenborn House at Tullyvallen - is very possibly an uncle of Thompson BROWNE. Rev. BROWNE’s wife was Margaret JACKSON, also their daughter, Eliza, was married to a nephew, James JACKSON. The proximity of the JACKSONs of Forkhill may also prove to be significant to the ancestry of the Tullyvallen JACKSONs. The Forkhill ancestors – leading back to the mid-1600s in Coleraine, Co. Londonderry - are well researched and include the Richard JACKSON (1722-1787) of the famous Forkhill JACKSON trust. Significantly, his family crest includes the same kind of bird that was incorporated into the crest of Sir Thomas JACKSON (1841-1915) whose ancestry traces back to the JACKSONs of Liscalgot in the mid-1700s and is a main focus of this web site. 1641 Down Survey Maps: Landowners of 1641 - Henry O'Neill. Sir Henry O'Neill owned the lease to Tullyvallen in the Parish of Creggan. He also held title to most of the other townlands in the Parish of Creggan. NOTE: I still need to find out which portion of Tullyvallen was Edward Rowley's retrenchment. Parish boundaries were later redrawn so that Tullyvallen is now in the Parish of Newtown Hamilton. Census: Patrick Groumy O Coune gent was the Titulado for Tullyvallane & Culehannagh, Parish of Creagan. Thomas Ball was Titulado for Clare & Cablane. No JACKSONs were recorded in Ardmagh at this time, but this Thomas BALL was either the same one who held land in Tulleyvallen, or else was his father. 1664 Hearth Money Rolls TOLLIVALLEN. About 249 acres of Tullyvallen, Parish of Creggan were granted to Thomas BALL to the use of Daniel & Sarah JACKSON. 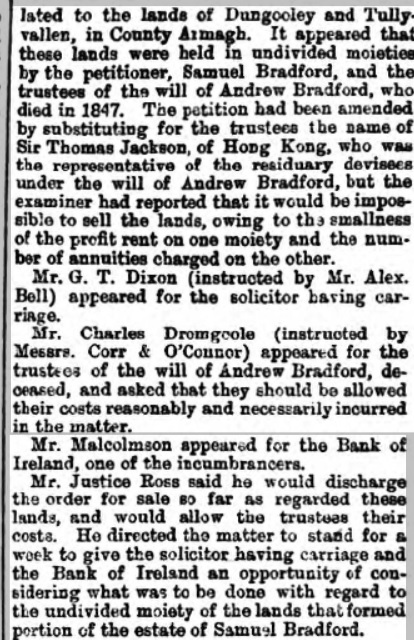 In another source, Thomas BALL of Creggan was also listed in Ferguson Certificates as having 5,253 acres as an assignee of Edward Richardson, Ellinor Blackiston, Dan Jackson, Sarah Jackson, Elisabeth Hepburne and Katherine Jones. SOURCE: The History of the Parish of Creggan in the 17th & 18h Century. L. P. Murray, Isaac Dobson, Wm. Frankland, J. Southey. Journal of the County Louth Archaeological Society, Vol. 8, No. 2 (1934), pp. 117-163. 45 THOMAS BALL, to y« use of DANL. and SARAH JACKSON — in ye north-east part of Edward Rawley’s [aka ROWLEY] retrenchment in Tullyvallan, 249a. 1r. 13p. plant. (403A. 3R. 20P. stat.) with a proportion of unprof., 3l 7s. 3½ d • bar Fewes, co Ardmagh SOURCE: Irish Records Commission 14th & 15th page 178. NOTE: p 179 there is mention that see the patent for other lands remitted which had been granted to John ORSON and Edward ROWLEY but are not passed to them under ye Acts of Settlement all of which had been conveyed to and purchased by the said Ball. NOTE: Edward ROWLEY was slain in battle December 31, 1641. His sister Anne ROWLEY married Sir Tristram BERESFORD (1669-1701). Her great-grand-daughter was Susan BERESFORD, wife of Capt William JACKSON (1628-1688) of Kirkby Lonsdale and of Coleraine. Capt. William was the son of Rev. Richard JACKSON (1602-1681). It is possible that John JACKSON was a brother of Capt. William JACKSON. Daniel & Sarah were the infant children of John JACKSON of Antrim [SOURCES: Reports and Schedules claimed in respect of lands in Antrim]. John Jackson was one of the ex-soldiers settled in the Parish of Dunaghy, Barony of Kilconway, County Antrim who was displaced by Antrim's recovery of his estates His reprise in the Fews consisted of 249 acres ‘in the north east part of Edward Rowley’s retrenchment in Tullivallen’ and is included in the lands shown as Balls in the Book of Survey and Distribution. SOURCE: Armagh: History and Society: Interdisciplinary essays on the history of an Irish County. Ed. A.J. Hughes and William Nolan. Geography Publications 2001. . Land Confiscations and Plantations in County Armagh During the English Commonwealth and Restoration Periods 1650 to 1680. Harold O’Sulivan. p359. See also: An Historical Account of the McDonnells of Antrim page 466. NOTE: I assume that the children were either orphaned, or at least their father was dead. The reference to Antrim's recovery is to Randal Macdonnell, 1st Marquess of Antrim. He was a wealthy Catholic Landowner, who sued to gain back his estates and in 1665 succeeded, thus displacing the adventurers, such as John JACKSON, who had been awarded the lands as a result of their service under Cromwell. MacDonnell's 2nd wife was Rose O'NEILL, daughter of Sir Henry O'NEILL, but they had no issue. The Parish of Dunaghy includes 37 townlands, one of which is Ballyreagh - which means being cautious since there is also a townland of that name in Co. Down, as well as in Coleraine. NOTE: Dunaghy, the site of John Jackson's original land grant, is a parish just east of Ballymoney. It may be worth noting that there were two JACKSON with holdings in Ballymoney Town in the Antrim Hearth tax rolls in 1669: David JACKSON & ffranc aka Francis JACKSON. If John JACKSON was a son of Rev. Richard JACKSON (1602-1681), then Francis JACKSON was likely his brother. 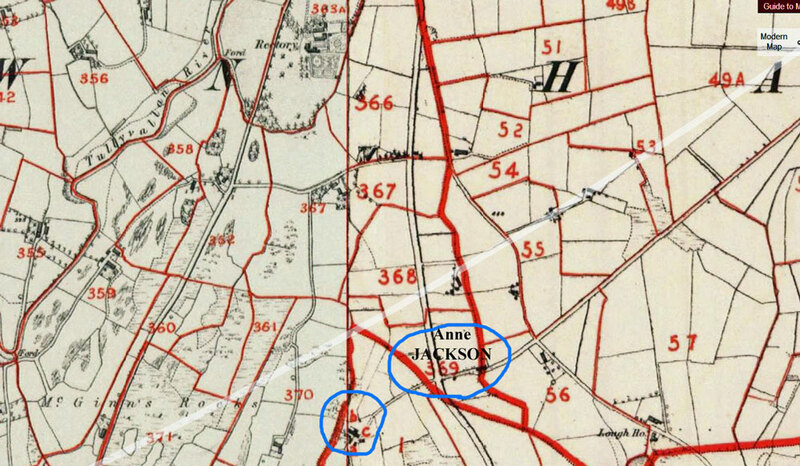 In the 1860s, at the time of Griffiths Valuation, there were 4 JACKSONs in Ballymoney. Some 50 years later, the land for Creggan school was granted by a Thomas BALL. Like George JACKSON, he was supposedly a descendant of one of Cromwell’s soldiers. He was probably a grandson of Lieut. Thomas BALL of Fleetwood’s Horse. SOURCE: P 15 Creggan Charter School 1737-1811. Mary Cumiskey, Creggan Local Historical Society. 2007. Unlike modern maps, North is at the bottom. The townland boundaries in 1656 differ from the boundaries at the time of the Griffiths Valuation. In the mid-1700s, Jacksons held a lease at Tullyogallaghan (aka Boggy Mountaine Pasture - in 1641 it was held by the church), a townland slightly to the east of Tullyvallen. I suspect there is a connection between these Jackson leases, but I have yet to prove it. Memorial of agreement 7 Nov 1733 btw Rt. Hon William GRAHAM Esq. son & heir residuary legatee of John GRAHAM late of the town of Drogheda, Alderman & John JOHNSTON of the Fews , Co. Armagh …various lands including Tullyvallen leased from William CUNNINGHAM of Moneymore, Derry. Reference lease 2 August 1695 by John GRAHAM father of William GRAHAM . WITNESS: Rev John GRAHAM of Town of Drogheda & Charles CALDWELL of City of Dublin. Deed: 75-260-52844 John JOHNSTON of the Fews, Co. Armagh & John Archdeacon of City of Dublin Gent – transfer interest in article made 22nd Aug 1698 btw William CUNNINGHAM of Moneymore in Co. Derry & John GRAHAM late of Drogheda. Deed: 78-23-52843 Memorial of agreement 7 Nov 1733 betw Rt. Hon William GRAHAM Esq. son & heir residuary legatee of John GRAHAM later of the town of Drogheda, Alderman & John JOHNSTON of the Fews , Co. Armagh …various lands including Tullyvallen leased from William CUNNINGHAM of Moneymore, Derry. Diocesan records at PRONI 14973: Cows and turf were purchased from the Master’s father (referred to as Mr. Jackson) at a cost of £12. This would seem to indicate that George JACKSON’s father lived close to the Charter School at Liscalgot and Tullyvallen would fit the bill. Thomas TIPPING leased to James McCULLAGH 18 acres of lands of Tullyvallen Cunningham. John BROWN was a brother-in-law of these McCULLAGHs, who are also likely to be related to the same McCULLAGHs who married into the JACKSON family. 249-Geo II, Lease 10 Aug 1745. Henry MITCHELL of Dublin & Alexander HAMILTON of Dublin. An undivided 1/2 of Tullyvallen, B.vallen, Drumhill & Tullynavall as conveyed to him by John BALL to hold for lives of himself and his sons Hugh & Robert forever at peppercorn fine at 139.10 pounds for 1st 11 years and the 155 pounds. Enrolled 11 Sept 1745. NOTES by TGF PATTERSON: Notebook #112 Vol 2. Held at the Armagh Museum. At a reasonable rent, for lives renewable forever, from the first day of May next, several convenient farms, all in about 1600 acres of good land, part of Tullyvalen, in the Barony of Fews, and County of Armagh, lying on the great road leading from Armagh to Dublin by Dundalk, the estate of Alexander Hamilton Esq. ; within 8 miles of Armagh, eight of Newry, 11 of Dundalk and four of Castleblaney, all good market towns, and on which lands of Tullyvallen is held a market every Saturday. On each of said farms there is plenty of good meadow and turf; a large river runs through the middle of said lands and never wants water sufficient to turn many Mills, with many places very proper for bleaching greens, and a fall of 180 feet in less than 2 miles, and places where mill ponds may be easily made. By the great plenty of turf, water, bog, timber for building, and meadow, the linen manufacturing and distilling may be carried on as cheap as in any part of Ireland.--- Mr. Hamilton’s servant at his house on the lands, will show the ground; and those who have a mind to take any part of it, may send their proposals to Mr. Hamilton at his house in Henry St., Dublin, or give the same to Mr. John Gordon, a merchant in Belfast. This description fits with the picture of the JACKSONs being supposedly connected to the linen industry. PRONI MIC555/6 Copy of the deed of settlement made between and among the co-heiresses of the late Francis Hall.1762-1771. Original lease (of 1765) and 4 case and other papers, all all relating to 'The lands of Conlon and Tullyvallen Tipping [barony of Fews, Co. Armagh, which] were demised by the late Mr [Thomas] Tipping of Beaulieu to Mr [Faithful] Fortescue, as is supposed in trust for the family of Beaulieu, at a small rent for 3 lives ..., [and] afterwards demised to Mr Garstin by Mr Fortescue in trust for Laurence Plunkett, a Roman Catholic, at the improved value, and Plunkett afterwards sold his lease to Mr Waddle. 1765 Rev. Mr. McCOMB's Seatholders: Robert McKAIG; Samuel McROBERTS; Robert THOMPSON; John CONN; Richard JACKSON; William CONN; William KENNEDY; James McANLIS; John McCONNELL; Hugh BAILIE; John LOWRY; John KENNEDY. SOURCE: A Statistical Account of the Barony of Upper Fews in the County of Armagh. John Donaldson 1838, p15. Owen JACKSON of the Five Towns in the Parish of Creggan. Richard JACKSON of Tullyvallen NOTE: He was also included in the Townland of Tullivallen in the list of Rev. Mr. McCombe's Seatholder's List for 1765 (indicating that he was Presbyterian?). SOURCE: John Donaldson Account of the Barony of Upper Fews. Creggan Local History Society, Crossmaglen, 1993. p15. NOTE: Nailing the ancestry of Richard JACKSON will likely be key to finding the link to the generation that precedes our earliest known ancestor, George JACKSON (1718-1782) of Liscalgat & Urker. 1768 Mar 3 ROD: 271-36-173316. BTW John REED the elder of Lurganah, Parish Armagh, Co. Armagh to his son John REED the younger osf same. 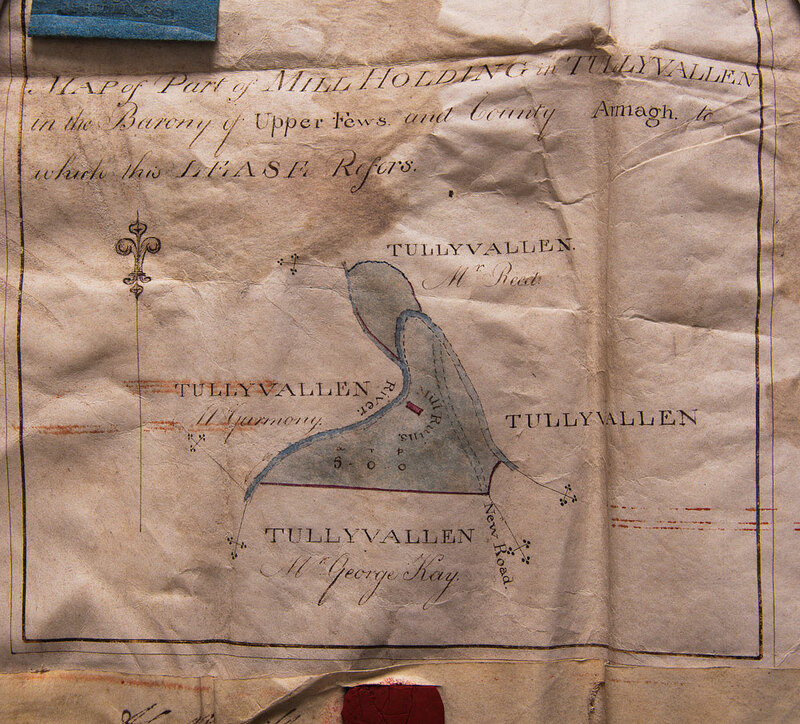 Those parts of Tullyvallen formerly held by Robert ROLAND, Terence HUGHES, Edmund HUGHES and Thomas HUGHES, also one acre of John REEDs turbary James McCLANLASS’s & mearing a road from same by John MATHERS, mearing across the little river where Bernard HUGHES dwelt containing 147 acres & 32 perches with right to quarry limestone etc. In Creggan Parish & Fews Barony. Held by lease for 99 years from Alexander HAMILTON to John REED. Registered Dec 5, 1768. NOTES by TGF PATTERSON: Notebook #112 Vol 2. Held at the Armagh Museum. 12 Nov 1768 Btw Robert PATTON Tullynale [in Tullyvallen], Parish of Creggan, C. Armagh. & John LILY of Bresagh, Co. Down, farmer. 40 acres meared and bounded by Francis HAMILTON’s farm and Samuel HARRISON’s situate in the townland of Tullyvallen, released to William WALLACE of Newry. WITNESS: Isaac GLENNY of Dublin, Arthur ATKINSON. ROD: 270-405-172912 NOTE: In 1840, a William WALLACE was a witness to a JACKSON marriage. Also in 1839 a Richard JACKSON of Tullyvallen married a Mary WALLACE. 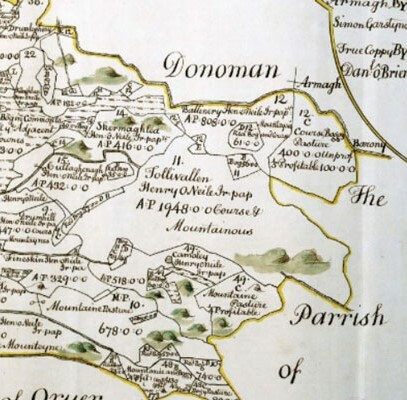 1773 20 townlands that had been included in the Parish of Creggan were included by Primate ROBINSON, Archbishop of Armagh, in the Parish of Newtownhamilton. 50a out of the Glebe lands of Creggan Parish were exchanged with Dr. Hugh HAMILTON, then Dean of Armagh, for part of the lands of Tullivallen. SOURCE: A Statistical Account of the Barony of Upper Fews in the County of Armagh. John Donaldson 1838, p4. 1 Nov 1780 NOTE: I have misplaced the citation that should be here. Tullyogallaghan is on the eastern border within the Parish of Newtownhamilton and is only a couple of small towns away from Tullyvallen. I have been unable to find Tullyagomore. It is possibly within the borders of what would now be Dorsey. Will of Robert Ballie, of Tullyvallen, Co Armagh. Hugh BAILEY aka BAYLEY, farmer at Tullyvalley. Tullyvalley may be Tullyvallen – based on ongoing family presence at Tullyvallen. The will of Joseph JACKSON of Tullyvallen was probated. NOTE: Rootschat: Joseph JACKSON & Mary LONSDALE b 1810??? immigrated to Australia on "Herald"1841 from Belfast with their family.Their County Armagh. Their shipping papers say their native place is Altnamackan Newtownhamilton. His parents Joseph & Martha Jackson, & her parents Thomas & Lonsdale. NOTE: I do not know where I once saw this probate. Creggan Parish register – burial. Value of estate of John JACKSON (1780-1817). John BRADFORD leased from Alexander HAMILTON in the names of Francis & John BRADFORD as well as David CARROLL. William, son of John BROWN of Tullyvallen born. Andrew Coulter BRADFORD was the nephew of Margaret BRADFORD who in turn was the widow of David JACKSON of Liscalgot & Urker. In the Tithe Book The names of the tenants are grouped in 32 divisions, which correspond to individual landholders, or townland sub-divisions. One of them is COULTER FULTON &c.
Richard JACKSON was one of Captain REID’s tenants at Tullyvallen Hamilton. Other landlord names of interest with respect to possible family connections are: Captain REID’s tenants; DONALDSON &c.
John Jack, lessee of Alexander Hamilton, Esq., versus Walter MM`Geough Bond, Esq. This was an ejectment for the recovery of a certain portion of the lands of Tullyvallen. It came on for trial on Saturday morning, and occupied almost the entire day. -- the details were most dry and uninteresting: the merits of the case may be compressed into a nutshell. The matter in dispute was two acres and a half of land of a boggy description. The ancestors of the present Mr. Hamilton, who held the estate in fee, granted a release, in 1756, a farm called Tullyvallen, to a Mr. Tipping; this lease was for lives renewable forever. The farm so leased had descended to a Mr. Montgomery, from whom it was purchased by the father of Mr. Bond. Adjoining this property was another, called ``the Mill Farm``, which also had been bestowed by Mr. Hamilton's ancestor but had now reverted back into his own hands. Between these two farms lies a disputed piece of land; it was formerly a bog but having been lately drained, we believe by an under tenant of Mr. Bonds, on part of the Tipping farm, has become a subject of more importance than originally, perhaps it was entitled to. The object of the plaintiff was to show that the bog tract did not belong to, nor had ever constituted part of, Mr. Tipping's farm; to this end a variety of ancient documents, and a number of as ancient men were produced -- Nonagenarian, excited some merriment in Court, when being complemented by the judge on account of the quickness of his ear and the keenness of his eye, he replied with the utmost naievite, ``oh my Lord, I'm well taken care of -- I've got a young wife!`` -- In the same way the counsel for the defendants distinctly proved that the disputed land did not belong originally to the Mill Farm; -so that it does appeared the bog, in the old surveys, had not been included in either one farm or the other. This however, while it would have militated against lease holders of these farms, did not affect the right of Mr. Hamilton, as owner of in fee of the entire property. Such was the view taken of it by both judge and jury, and a verdict for the plaintiff, in consequence, recorded there was but another record for trial. Given that I have seen no record of a John JACK leasing in this vicinity in this time frame and there are records of JACKSONs, I am tempted to suggest that this is perhaps a John JACKSON. He was the Presbyterian minister. 19 Dec 1834 Note the absence of JACKSONs - although John DONALDSON (abt 1818-1854) was the husband of Elizabeth Johanna JACKSON (1817-1900) who was born at Urker and died at Kiltybane. Thomas ROWLAND was likely related to Susannah ROWLAND (abt 1779-1865) of Tullyvallen (her son was a Thomas ROWLAND - see death cert details under 1865. Mary JACKSON & John McCULLAGH had a son Robert baptised. They were of Cloghog. A James JACKSON had a holding in Newtwonhamilton noted in Griffiths. James JACKSON son of Richard JACKSON & Sarah McKEE his wife of this congregation to Fanny daughter of [blank] McComb____? [blank] his wife of the congregation of Covenanters at Bellilane. Present at ceremony John McNEELY & John JOHNSTON. On the 27th ult by the Rev. S.G. Morrison, Minister of the Congregational Church, Armagh, Mr. Richard Jackson, Tullyvallen, Newtownhamilton to Mary eldest daughter of the late Mr. Edward Wallace, Drumgaw, Armagh. BNL Sep 10 1839. Archibald BIGGAM of the Congregation of Clarkson son of Samuel BIGGAM & Mary BUTTER to Sarah JACKSON daughter of Richard JACKSON & Sarah McKEE his wife of this congregation. Present John JACKSON, William WALLACE & Edward WALLACE. THAT part of TULLYVALLEN, containing 36 acres and two roods, late Irish measure, within a quarter of a mile of Newtonhamilton, and held by lease for three lives, renewable forever, at a small yearly rent. These lands are used as Town-Parks, by solvent and respectable tenants. Also to be sold, A GROUND RENT of £15 PER YEAR, arising out of HOUSES IN NEWTONHAMILTON, held under a similar lease. The whole producing a clear well-paid Profit -- Rent of £71 per year. For further particulars, as to title, etc., apply to WILLIAM BARKER, Esq., solicitor, Armagh; or, WILLIAM REED, Esq., Ballymoyer. Dated 16th of October, 1843. Settling of accounts of the late A.C. BRADFORD mentions balance of the rents of Dungooley & Tullyvallen. Much of the note is illegible, hence I have not yet transcribed it in full. Letters of Administration of the Personal estate of John Donaldson late of Tullyvallen in the County of Armagh deceased who died 1 November 1854 at same place were granted at Armagh to Elizabeth Donaldson of Tullyvallen aforesaid (Newtownhamilton) the Widow of said deceased. Griffiths Valuation was completed for Armagh in 1864: An Anne JACKSON is the lessor of two modest buildings and the occupier of one piece of land amounting to 9 acres. Rev Daniel Gunn BROWN[E] – house valued at £6.0.0. as well as 30 acres of land rented from reps of John REID. Note this was near the more substantial holdings of Rev. CROSSLE. Alexander STITT is in the town of Newtownhamilton living in buildings valued at £24.0.0 and also owning buildings valued at £16.0.0 which he leased out to Michael MARKEY. Ellen DONALDSON leased building(s) valued at £19.5.0 on 13 Newry Street. Likely the Ellen DONALDSON who lived 1816-1888. She also leased two properties neighbouring one owned by Alexander STITT. A James JACKSON was also on the same street. p 69 Anne JACKSON leased one holding [#369] from Rev. Alexander H. SYNGE: 5 perches valued at 3.15.0 (NOTE: Why was the value of this land so high when the acreage was so small?) Anne JACKSON also held title to two adjacent buildings (likely small cottages): 369a valued at 0.15.0 leased to Peter DUFF and 369b valued at 0.10.0 leased to Bridget MALEW. NOTE: On page 55 of the Revision Valuation Books 1864-1876, the name of Anne JACKSON was struck off. James WARRINGTON assumed the house and land leased from Rev. Alexander SYNGE (it would seem to be in 1867). The land included 9.0.5a valued at 3.15.0, and the value of 1.0.0 for a house was added making the total value 4.15.0. 1865 Jan 7 Anne JACKSON (1810-1865) died age 55 after 10 months of phsisis. Her son W. JACKSON was present at her death in Tullyvallen. There is no record of her burial at either Freeduff or at Creggan. She is a perfect fit with the Anne JACKSON in Griffiths valuation above. Also, W. JACKSON is an intriguing match for a J.W. JACKSON who wrote a letter in 1900 to his "cousin" Thomas JACKSON. In a letter from 1893, Eliza Jackson, the mother of Sir Thomas Jackson says: I had another letter from England. John W. Jackson’s foot is not yet so well that he can wear a boot. I sent him the remaining two pounds today. On Dec 22, 1876, a John William JACKSON married a Sophia SHEKLETON in the Dundalk Parish Church. He was a saddler and his father was a John JACKSON. He is very unlikely to be the son of Anne. 1865 Jun 2 Death of Susannah ROWLAND, age 86, widow of farmer. Son Thomas, occupier of home at Tullyvallen. SOURCE: Death cert. The Will of John Donaldson late of Tullyhumphrey County Monaghan Farmer who died 20 October 1887 at same place was proved at Armagh by Mary Bailie of Tullyvallen County Armagh Widow the Surviving Executor. The Will of Charlotte Bailie late of Tullyvallen County Armagh Widow who died 5 August 1892 at same place was proved at Armagh by David Donaldson and James Meeke both of Tullyvallen Farmers the Executors. In a letter of 1896, May 20, Eliza JACKSON writes to Thomas JACKSON: Derryvalley & Tullyvallen being a joint property are in the hands of the Receiver who has been appointed over Sam’s property; but eventually I am told, we will get our share. Interesting that the case dragged on for so long. In the High Court of Justice in Ireland, Chancery Division, (Land Judges) in the matter of the estate of Alexander Hamilton Synge, owner and ex parte George Christopher Lawder, petitioner, the sale, by auction, of the rental and particulars of part of the lands of Tullyvallin otherwise Tullyvallen, containing 965a. 3r. 1p., statute measure and part of the lands of Tullynavall, containing 16a. 0r. 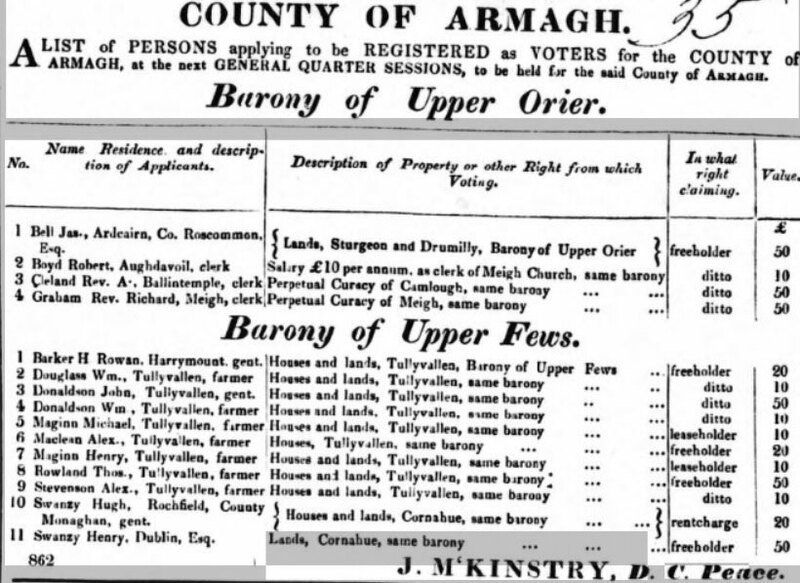 35p., statute measure, both situate in the Barony of Upper Fews, county Armagh. Includes surnames McConnell, Tierney, Hamilton, Callan, Connell, Runcie, Logue, Quinn, Kerly, Byrne, Cooke, Pretson, Sinton, Maclean, Black, Mulligan, Douglas, McMath, Stitt, Morris, McFerran, Morrison, McCage, Shaw, Palmer, Babe, McCaffery, Synge, McClean, Maguire, Wright, Kennedy, McMurry, Garland, Pollock, McCamon, Simpson, Oliver, McCardal, Aull, Kelly, Pepper, Kearney, Kilpatrick, Well, Carraher, Mallon, Fitzgerald, Boyd, Patton, Jenkins, Porter, Marshall, Tell, Swanzy, Bailie, Reid, Hughes, McAnlisse, Mathews, Reed, Ballard, Gass, Corbett, Wiles, Lennon, Ard, Carroll, Mackin, Kincaid, McBirnie, McWillie, Cooke, Lowry, McMerdy, Couser, McCombe, Milligan, Donaldson, Mulhollan, Melvin, Cowan, Copeland, Callaghan, McCullagh, Gilmer, Charlton, Bradford, McGowan, McAnlis, Read, Murphy and Bond. Includes maps of properties. Letter from William REID to Mary GRIFFIN about annuities being paid on Dungooley & Tullyvallen. Letter from Bessie BROWN to Mary GRIFFIN re: Dungooley & Tullyvallen.